Available only at The Container Store, our Elfa Utility Board Hooks fit onto an Elfa Utility Board and are sized to hold a variety of items. The curved end keeps things in place. Positioned one anywhere it's needed along the Board. This smart system can be used anywhere in your home to maximize vertical space and get you organized! Build your own customized solution with our Elfa Utility Door & Wall Rack Planner. Platinum Elfa Utility Board Hooks is rated 2.9 out of 5 by 26. Rated 1 out of 5 by BoRuShopper from low quality and not versatile Although this system is billed by the container store as being comparable to pegboard, it certainly is not either in terms of quality of the hooks (in one package you can find some that are easy to install while others either don't install easily or are loose when installed) and the versalilty. It's easy to break one of the hooks when trying to snap in the poorer fitting items. There are only a few different sizes and they don't fit the common tools that one would want to hang. There is only one circular type hook and it doesn't fit most standard tools: too large for standard screw driver handles - (don't be fooled by the photos - they apparently selected screw drivers with fatter than normal handles); too small for a set of pliers or hammer handle. When you ask in a store if elfa will be coming out with more versatile hook selection, no one seems to know. Rated 5 out of 5 by Kella703 from Awesome I have recently converted from peg board to utility board for jewelry craft and material organization and couldn’t be more pleased. The utility board quality as well as hooks gives my space the neat appearance with superior functionality. The plastic is very strong for tools and equipment and I couldn’t be happier with the variety of hook options maximizing space. Once you get started with elfa options you won’t know what you did before to keep items organized! Rated 3 out of 5 by Pandabot from Careful when installing Be careful with these delicate plastic hooks. They do work nicely just for the Elfa board system but their plastic hooks are very tricky. Would have been better if they used a harder, denser plastic in the back. It can very easily shear off when you're installing it to the board. Too hard pressure and it'll break. Rated 3 out of 5 by NYer from Multi-Functional Pieces But Poor Quality I admittedly have way too many ties and was looking for a creative solution to hang them and free up close space. I didn't like any pre-made tie racks I found online as they were limited in how much they could hold and ugly. I stumbled across these hooks and the door rack system/boards from Elfa and got creative with it - the long hooks were the perfect depth to hang my ties on! My only complaint is the quality is not the best as they are low-grade plastic; I snapped a few as I was affixing them to the board so I have to order more. As long as you don't apply too much pressure when installing or hang too much weight on them; you should be fine. I wish they'd offer a metal hook for these boards as I would have purchased those instead. Rated 1 out of 5 by venusc from Worthless In my opinion these are worthless. The slightest touch and they fall off of the board. A real shame. Elfa needs to make them so that they secure to the board. I was able to return them, but only by driving an hour out of my way. I should have believed other reviewers. Rated 2 out of 5 by MyExperienceWithIt from Break easily while putting them up Elfa Utility hooks in general (especially the curved and circle ones) are breaking too easily when we tried to put them up on the utility board. Also, they have very specific uses and don't accommodate many things in a typical tool room. we have had to order magnetic strips and tool organizers to go over the utility boards for half the stuff in the tool room. Elfa doesn't seem to have a evolved solution for tool rooms. Rated 2 out of 5 by AKDC from Long arm has thick base I ordered the long arm hooks to hold a bunch of rulers that each have a 5/8" hole. Unfortunately although the rulers fit on the hook, the "stem" of the hook gets bigger toward the base, so I have 2" of wasted space and not enough space for the rulers. PLEASE, Container Store, make hooks that are designed to hold multiple small items! Rated 4 out of 5 by SamanthaV from Figured out how to install these finally! These were nearly impossible to install without breaking them (or injuring myself) - but I figured there HAD to be a way to do it easier. I found 2 approaches that worked very well. 1) with the "neck" of a hammer head nestled on top of the hook, near the back part of the hook where it meets the wall - tap the hammer lightly with a mallet, down - it pops in easily. Remove using the same technique, tapping upward instead. 2) Using a mallet directly (with the hook resting in the slot you want it in), tap the top edge of the vertical part that holds the hook. It snaps in very easily. To remove, gently tap the bottom edge of this vertical part of the hook, right up against the pegboard. It pops out just as easily. Rated 1 out of 5 by RickinFlorida from Great metal "pegboard" but cheap cheap cheap hooks The hooks are plastic and there are only four kinds. WHAT WAS I THINKING? The metal pegboard looks good, but it's almost useless once it's up because of the cheap hooks, with only plastic containers and a couple of metal shelves that can also be used on the board. And don't even THINK of using the metal board is you want to span (go over) an "easy hang" standard. They have a lip that hits the standard and it has to be cut out. Nice looking, poor functioning. Rated 3 out of 5 by romille from Too thick I tried all four of these board hooks. In the end I kept the long and circular hooks, but took the other two back. The long hooks were the only ones that attached to the board easily, the short hook refused to latch properly. They were all too thick to be used with the holes in the handles of my rotary cutters. I ended up using the long hooks to hang embroidery hoops and tape rolls, while the circular hooks hold scissors. The other hooks were pretty useless for me. I also used some of the slim hooks to hold other pairs of scissors, but these thick rounded hooks took up too much room on the board and were getting in the way of my magnetic see and store containers. The slim hooks are the best! It would be nice to see some slimmer hook options that would actually work to hang my rotary cutters. And it would be nice if they were all as easy to install as the long hooks and slim hooks are. Rated 2 out of 5 by RCJ01 from Grrr... A great idea, but these plastic hooks require so much force to install that the attachment point on the back often snaps rendering the hook completely worthless. I have lots of elfa stuff around my home, and I absolutely love it, but I doubt that I'll buy these plastic hooks again. Rated 4 out of 5 by JohnSmith from To all those with difficulty attaching In order to attach these hooks, you have to engage the small plastic hook in the back and then bend it out so that the hook can fall into place and then snap it back into place. To those complaining about weight problems, as long as you don't hang ridiculous things (greater than 3-4 kg) off them, they are fine. Rated 4 out of 5 by PapaBill from Elfa Utility Boards-Need Broader Selection of Hook Just installed three 3'x15" Elfa utility boards. Started to hang tools and found utility hooks were too thick or rounded to accommodate a lot of my tools. Need straight hook (not an "L" shape), 1/8" to 4.0mm in diameter, slightly elevated to slide tools with small holes straight on...like peg-board hooks. Also, the Board Hook Circle is too big for some screw drivers and other straight tools. Need Board Hook Circle one-half the diameter. Overall, I really like the Elfa Board System, but they need to expand the types and styles of hooks. I have passed this information on to The Container Store technical staff. Rated 4 out of 5 by goldent from Hooks can handle a lot Bought these board hooks in different shapes and sizes. Good for hanging scissors, etc. Rated 4 out of 5 by Warpzone from Nice and Saturday, although difficult to attach I burned through two of these bad boys trying to get them into the board wall mount. The directions were delightfully unhelpful as I broke off the delicate little tabs on the back of the hooks, one after another. Then by accident I managed to get the third hook in without breaking the tab, by some flick of the wrist that I could not replicate reliably afterwards. Since then I've bought two more bags of these hooks and have not broken them ... I've just been extra careful getting them in the wall mount and fidgeting with them patiently until they pop into place. Nice and sturdy once they're in, but god help me if I need to move them. Rated 1 out of 5 by ToniD from These break easily These little hooks break as you try to snap them on. If you are lucky enough to get them on, they break and snap off easily while using. They are poor quality and disappointing. Rated 1 out of 5 by normkr from Utility Board Hooks These hooks are very poor because they are made out of plastic. Place anything on them with reasonable weight and the top plastic pin behind the hood will break off, rendering the hook useless. This already happened to me three times. This is a shame since the design of the utility board on which these are place is very good, as well as the overall design of the hook--the use of plastic here is poorly thought out. If they were instead made out of metal, as they should be, the design would be excellent. Rated 3 out of 5 by nauq from hard to attach they have a nice compact size to them so it features good flexibility for the utility board, however, It was a little annoying to plug the hooks into the slots. Often time even if you push it all the way into the slot it doesn't catch and stay on very well. A bit of force helps. Rated 5 out of 5 by InfoBabe from Useful I like to have options available for immediate use. Rated 1 out of 5 by wasteofmoney from WASTE OF MONEY First off, these hooks fit as poorly into the pegboard shelf as the grammar in the description of this product. They DON'T hook into place and constantly pop off and fall out every time you lift something off of them. Secondly, the hooks are awkwardly shaped and are two fat to hold most items. They hold my measuring cups and that's about it. I'd love to buy more hooks for this product, but this is exclusively sold by the container store and hooks like this don't exist for long slotted peg boards. Waste of money. How am I supposed to hang anything on my pegboard? I would not recommend these cheap, flimsy, non-usable hooks to anyone. Is there a hook you would recommend to hold frying pans and pots? No. These hooks are made of plastic and can only hold so much weight. If your pans and pots are light then they might work. How many pounds can each hook hold? I note a number of reviewers complaining of hooks failing when overloaded. 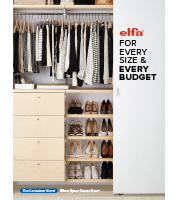 Are the Elfa utility board hooks rated to hold a certain number of pounds? I wouldn't put more than 5 lbs of pressure on these hooks. I snapped a few trying to affix them to the board. Besides shape differences, is there any reason to use these Utility Board Hooks over the Utility Hooks, since the latter can also fit on Standards? It seems like the Elfa Utility Hooks (http://www.containerstore.com/s/elfa/components/elfa-utility/platinum-elfa-utility-hooks/123d?productId=10034906) are more versatile, since they can attach to both Utility Boards and Standards. So is there any reason to go with these Elfa Utility Board Hooks instead, outside of differences in shape of hook? Do they attach better to Utility Boards? For the storage and organization of various tools and implements, our elfa utility Hooks and elfa utility Board Hooks are equally well suited. Our elfa utility Hooks alone do have the added distinction of being able to be used in conjunction with our elfa Easy Hang Standards. Do these hooks also fit into the standards, or only into the utility boards? The utility board hooks are specifically designed to fit into the utility board only.